Hi, You will be told in this post. How many ML oil will take in the UF Capacitor rotary compressor. Below you will get a compressor list. Wfich in which you will take the power of compressor and which capacitor with and how much oil will be charge in it. 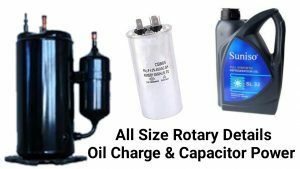 Hello Friends apko is post mai information de hai k ap rotary compressor mai kitny ton ka ho to usmy kitna oil chrge or kitny uf ka capacitor lagao gy umeed hai apko ye information help dy ge is field mai nichy apko list mily ge..
Sir dis s really helpful thank u so much . I saw ur video abt oilcharge. But i cant understood. Bcoz am tamilwalllllllllllllllaaaaaaaaa.